Everyone that regularly visits a casino will know one: the constant whiner. Their world is full of doom and gloom. They always lose. And even if, by chance, they are up one day, it won’t last very long. Because you know how unlucky they always are, right? When the night is finally done, and they are in the red, they will say: “Told you so. Always unlucky”. Brick and mortar casinos are full of colourful and very different kinds of gamblers. Some people are there for a good night out. Others are there for the first time. Some gamblers know their stuff. And there are gamblers who think they know their stuff. And don’t forget the one that believes in higher powers. We have compiled a list of ten different kinds of casino gamblers. Which one are you? 1. The Know-it-all. This person knows everything better than you. Are anyone else for that matter. He knows (or at least thinks he knows) every casino game inside out and will not hesitate to advise you on every single step that you take. Without asking if you even want any advice, of course. He will tell you whether to hit a card at Blackjack and will relentlessly tell you in great detail about his winning Roulette system. Know-it-alls are best ignored. They will kill any fun and drain your energy. 2. The Sore Loser. This type of gambler does not see gambling as a form of entertainment. He does not understand that with every form of gambling there is some winning and some losing involved. He will turn every situation into a negative and try to find fellow sore losers. Misery loves company, after all. Avoid at all cost and never let the sore loser spoil your day. 3. The Voodoo Player. Probably the most entertaining gambler in any casino. They might not be the sharpest tools in the shed, but they don’t care. Voodoo slot players firmly believe that they can influence the outcome of every spin by rapidly pounding every button, doing some criss-cross hand ritual above the slot screen, muttering some secret magic spells or by doing a small rain dance. Usually, the voodoo slot player also has a good luck charm in the form of a necklace, a doll of some sorts or lucky underwear (we guess!). A great species of gambler to observe from a small distance. 4. The Watcher. The watcher is more of a passive gambler than an active. The watcher doesn’t play, he watches. Preferably for a long time, without making a sound and right behind you. You never know actually how long they have been silently watching you. Watchers are somewhat creepy and will give you an uncomfortable vibe. Once you catch on to them the best way to deal with is to turn around, stare right back and say nothing. Be even creepier than them. Usually, they will just go away. 5. The Screamer. A complete opposite of the watcher. The screamer, often found in casinos of the Las Vegas Strip, is always a woman and is usually found in packs of fellow screamers. They have fun gambling, and the whole world has to know about it. They always play slots with an old fashioned handle and will look for the biggest slot machine around (think Big Bertha). They pull the handle together on every spin and cannot contain their first small screams of excitement. The reels start rolling and stop one at a time. A cherry, a bar and another bar. Three whole credits. Then all hell breaks loose. The “mega win” is celebrated with an explosion of high pitched shrieks, followed by multiple high fives and the obligatory “Whoo-hoo’s” and “Vegas, baby’s!”. All this ruckus attracts so much attention that curious nearby players come to take a look to find out who won the multi-million progressive jackpot. Three credits. Even if someone wins a nice amount of money in their direct vicinity, they will claim that the person works for the casino. In no way, shape or form will the conspiracy theory gambler accept any valid argument or fact which would prove their theories wrong. The best way to handle this type of gambler is just to play along. You might even have some good fun with that. 7. The Loving Couple. Often a married couple that takes one nice trip per year as a treat. Throw in a boutique hotel (although nothing too fancy! ), a romantic dinner and a visit to the casino. 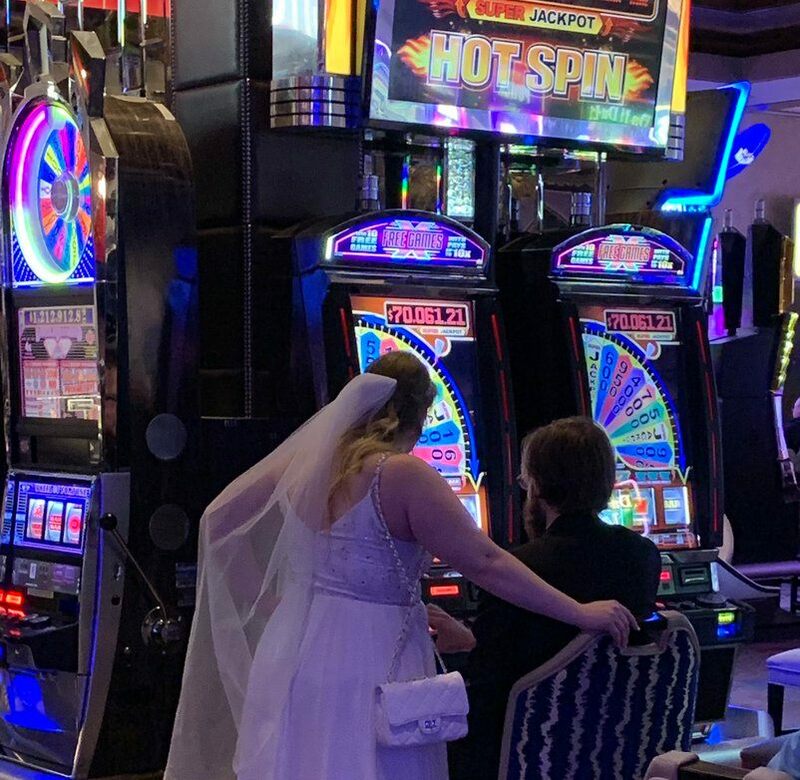 They will not do anything without each other, pushing the slot button at the same time and even planning each bet at the Roulette table in complete harmony. They are enjoying every moment of their time at the casino. Adorable and sweet. 8. The Addict. Sadly, this kind of gambler is found at every casino. They will play at three Roulette tables or multiple slots at the same time, not knowing when to stop. The addict will show compulsive behaviour, always looking for one more gambling rush. He will usually know most casino staff members by name and vice versa. Will visit the casino daily and be the last one to leave. 9. The Slots Friend Club. Mostly, middle-aged women, these slot friends will typically chain smoke and have a strong preference for a certain favourite slot or bingo machine. They have their own little area in the casino and will protect their territory at all costs. Do not dare to enter this terrority or even worse; try to play one of “their” machines. You will be told all machines are taken, even if they are not. They will often save seats for each other, sometimes for hours on end. There is no room for intruders when you are in a slot friends club. So, there you are. Ten kinds of gambler that will find in every land-based casino. Which one are you? Or are you a different kind of gambler altogether?